Juan Ferrandiz, born in Barcelona where he lived his whole life, is known for his drawings and paintings throughout Europe. Ferràndiz received his artistic education at the “Reial Académia Catalana de Belles Arts de Sant Jordi” in Barcelona, later became himself an art professor and devoted himself to the design of figures based on his particular predilection for childish themes. Famous are his illustrations of fables and poems for children, moreover his name is especially associated with the original Christmas cards, which express a whole own personality. Ferrandiz’s international reputation, however, resulted from the collaboration with ANRI, which brought many figures to life according to his designs. The first contact was already established in 1969 and the numerous works created by Ferrándiz during his working life have allowed the ANRI Master carvers to repeatedly create new ideas in the valuable wooden sculptures. Juan Ferrandiz was a very educated personality who, however, lived simply and according to his own style, always open to the development of our society. He was basically, a painter who wrote poetry and a poet who painted pictures. 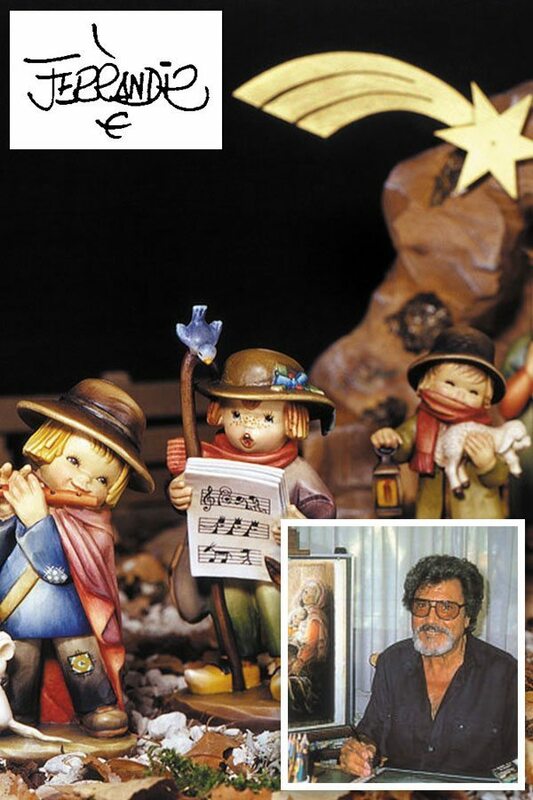 His entire work is dedicated to love, peace and unity, and one of the most successful presentations is the ANRI Juan Ferrandiz nativity – Christmas Crib. Juan Ferrándiz passed away in August 1997, at the age of 79.